Used Jewelry Buyer has been in business for over 15 years operating in the charming district of Historic St. Charles. We are conveniently located in the heart of it all on Main Street. 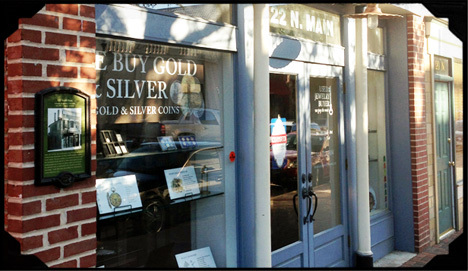 You won't find the flashing "sell gold" sign on our window and our door doesn't have iron bars on it – you can visit us in a safe, secure and friendly environment. Mostly likely you will be greeted by owner, Brian Hill, who has a hand in all the transactions of the business. I want my customers to get the most they can for their gold. The only way they can accomplish that is to know what they have before they sell it. Sure, it hurts my business when someone uses my information to get more somewhere else. But I want them to know that offering 80% to 85% is at the very top of the market for gold buyers. If you check around there aren't that many of us. In the end, I've found that customers appreciate our straightforward approach. It usually leads to referrals — which are the vital to the buying business. EXCELLENT CUSTOMER SERVICE - even over the phone! I don't know what the big deal is about giving out pricing. My best guess is that buyers that don't want to share pricing because they're worried you’re shopping around. If you call me, I'm will tell you what I am paying at that time. Keep in mind that until a buyer sees your valuables — it's just an educated guess. For example, if I give you a price on 14k scrap and you bring me gold plated scrap that will negate any previous verbal price. Try it, and give me a call at (314) 313-5804. Yes! We are really paying 99% of the spot price on gold bullion and coins. I know what you're thinking, how can he work on a 1% margin. Let me tell you, it isn't easy. One advantage as an independent buyer, is that I can sell it instantly, locking in a small profit and do not have the overhead that larger companies have. Plus, there are no refining costs. So we cut out a lot of expenses when trading bullion. Contact Used Jewelry Buyer today at (314) 313-5804 or visit our store in St. Charles, MO for more information.